I may be fooling myself, but I truly believe that we all have our own inner idiot. I'll even go so far to say that we have many idiots working behind the scenes. And those idiots are not usually aware they are idiots because they bear such a striking resemblance to ourselves, as if we had been replaced by an alien duplicate while we were sleeping. But occasionally, usually before or after doing the same idiotic things day after day, you have lucid moments. You know, for example, that if you pick up your iPhone to check email and read Facebook friend status updates, you will get off-track and have a difficult time getting back to tackling the projects that mean the most to you (and by you, I mean me). And at that moment, before you take the idiotic act, you have the opportunity to speak the language of the idiot (idiom?). You get some masking tape, and tape the iPhone face down on the table. You write on the tape, "Don't be an idiot!" and then quickly gather all the pieces of your project in the hallway, where you can't help but trip over them throughout the day. Take advantage of those lucid moments, because they don't last long. Plot how to trick yourself in simple but exaggerated ways that your inner idiots will understand. Set treats and traps (rewards and punishments). Tell yourself a good story that you can believe just enough to take action. Learn the tools of a good magician, such as misdirection. Fooling myself is something I use often onstage, to give the audience the impression that a calamity is happening for the first time. Even though I know a mistake is about to happen, I don't want to text the audience before it occurs and ruin the surprise (the metaphor used to be "to telegraph the audience", but that seems a little dated). By picturing myself accomplishing the character's intended goal flawlessly, placing at least part of my attention somewhere else than the mishap, and having practiced the bumble enough to do it semi-unconsciously, I catch myself off guard every time. One of the things I love about doing my show is that when things do actually go wrong, the audience thinks it's all part of the act. 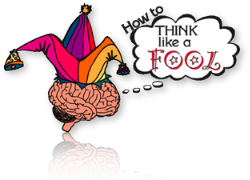 Think: How can I fool myself? What would I like my inner idiots to do for me and how can I best speak to them? Next: How to Think Like a Fool #44: Get Caught Up in the Moment.